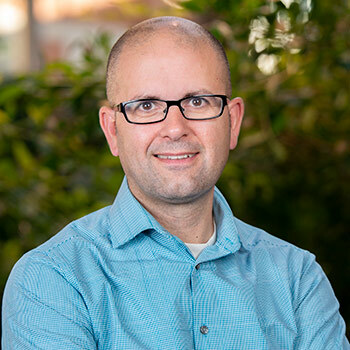 Waterloo – Stephen MacNeil, an associate professor of chemistry and biochemistry at Wilfrid Laurier University, is one of five professors across the country to be honoured with a 2018 D2L Innovation Award in Teaching and Learning. The award is presented by the Society for Teaching and Learning in Higher Education (STLHE) and D2L, the creators of the Brightspace online learning management system. It honours postsecondary educators who demonstrate innovation in their teaching practices. MacNeil was recognized for encouraging students to be active in their learning. He is known for the “flipped classroom” method of teaching, whereby lectures are posted in advance online and students arrive at class ready to discuss and explore the concepts. Two-stage collaborative testing, for which students write tests individually and then in groups to gain the benefits of peer-to-peer learning and immediate feedback, is another hallmark of MacNeil’s methods. MacNeil, who won an Ontario Confederation of University Faculty Associations (OCUFA) Teaching Award in 2012, said he was honoured to receive the D2L Innovation Award in Teaching and Learning. Other D2L Innovation Award recipients include Lyn Baldwin of Thompson Rivers University, Bernard Charlin of the University of Montreal, Alec Couros of the University of Regina, and Barbara Sinclair from Western University. The recipients will be presented with their awards during the STLHE conference in Sherbrooke, Québec, on June 20.